Johns Hopkins epidemiologist Lisa Cooper’s research focuses on health inequalities in Baltimore, particularly as experienced by the city’s African-Americans. 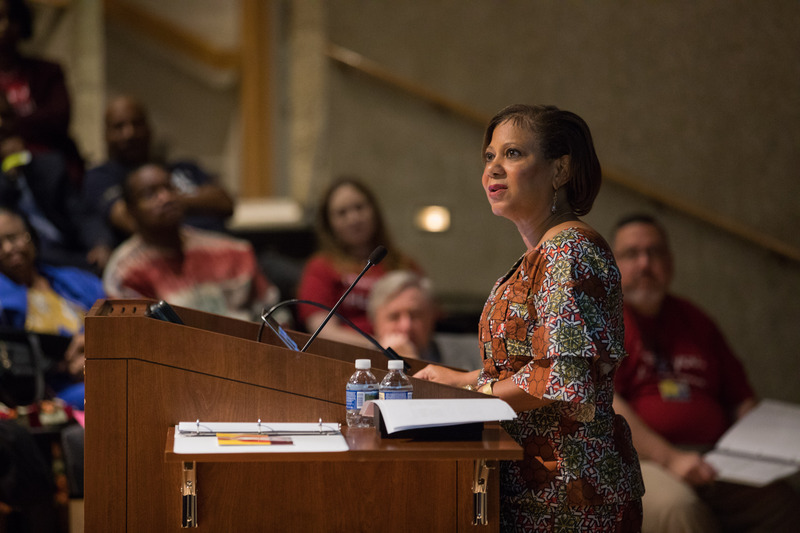 In her keynote address at the eighth Henrietta Lacks Memorial Lecture on October 7, Cooper illuminated the differences that African-Americans living in impoverished sections of the city experience when it comes to health. Cooper spoke to a nearly full Turner Auditorium on The Johns Hopkins Hospital campus at what has become an annual tradition. The lecture celebrates the life and contributions of Henrietta Lacks, whose proliferating cell samples have provided the foundation for many of the world’s most important biological research studies. The small tissue sample taken from Lacks during her hospitalization in 1951 yielded cells that would help advance scientific and medical research for decades. Cooper established the Johns Hopkins Center for Health Equity to learn more about and combat the health discrepancies that exist in Baltimore and across the United States. Her lecture, entitled “Health Equity and Social Justice in Baltimore,” pointed out that Baltimoreans living in the Madison/East End section of Baltimore — which is home to The Johns Hopkins Hospital — have a life expectancy 18 years shorter than that of city residents only 5 miles northwest in Roland Park. As an example, she said that telling patients to lose weight and get more exercise is hardly as simple as it sounds. The event also featured the presentation of the Johns Hopkins Urban Health Institute’s Henrietta Lacks Memorial Community Award, a $15,000 cash prize that recognizes exceptional collaborations between the university and local community groups. This year’s winner was Turnaround Tuesday, a program that is part of Baltimoreans United In Leadership Development (BUILD). Staff and volunteers of Turnaround Tuesday help unemployed and returning citizens of Baltimore re-enter the workforce. More than 350 people, many of whom work at The Johns Hopkins Hospital, have found full-time employment as a result of Turnaround Tuesday’s efforts.